I know that planning a thru hike can be overwhelming no matter how experienced you are. I had those same questions everyone has about the AT (how do you deal with the rain? which towns require a resupply box? should I use a down sleeping bag?…). I’ll do my best to sum it all up in an organized and concise way for you and I hope you all find it helpful! This would have been GOLD for me before a hike and would have saved me a ton of time, so I hope it helps! 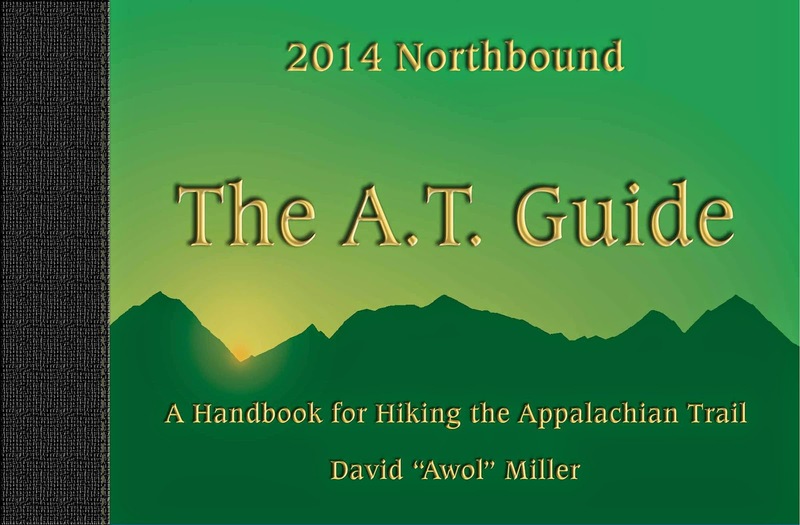 It seems that 90% of hikers on the AT use the AT Guide and solely that (without maps) to hike the trail. I know it’s shocking that people don’t carry maps, but the trail is so well marked that it isn’t needed and if you go off, the blazes are a different color and you quickly realize it and turn around.I am in no way telling you to enter the woods without maps, but I am telling you that’s what most hikers do. I would never go without some kind of map and I used an app which I’ll recommend below for GPS backup. Some like the pocket profiles for an overview, but they are in no way needed to hike and the detailed elevation charts are on each page. It’s a great guide and also includes all the town info you would need. It can be purchased Nobo or Sobo and with the option of having it bound as a book or loose leaf if you plan to ship the pages in sections. Only $15 and a steal for all that it gives you! I scanned it and had it on my phone as a backup and ended up using the scanned version instead and had the paper ones as backup. There is even an option to buy a pdf version that I heard has links that go directly to the website or phone number when you touch it. There are data books and companion guides created and sold by volunteers of the ATC, but I rarely saw one in use and only heard about how they were not as helpful as the AT Guide. It is unfortunate as I know many would like to buy a product made by the ATC, so there is that option if you are one of those people. The website, Appalachian Trials is a great resource for those new to the AT looking to answer a large array of questions about the trail. The Appalachian Trail: A 101 Guide is a nice organization of postings through Appalachian Trials over the years and quite helpful. Thanks to Zach for putting these resources together for FREE!!! 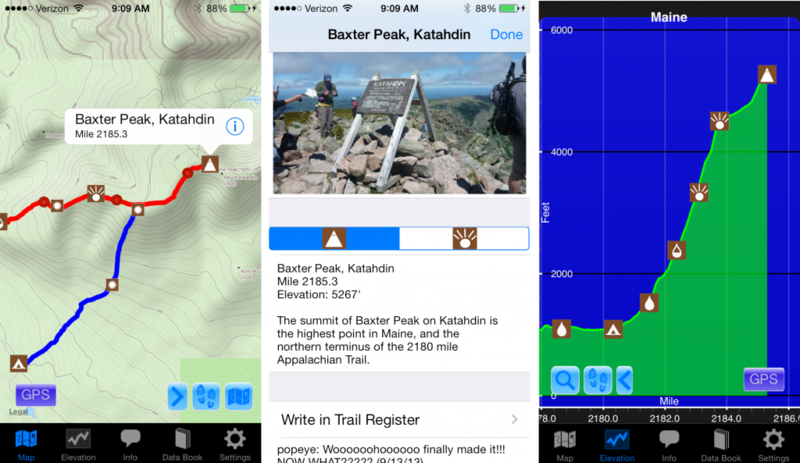 Um…Guthook’s AT Hiker App is AWESOME!!! It isn’t necessary to have this app to successfully hike the trail, but it certainly makes it a lot more enjoyable. I used this app just as much, if not more than the AT Guide. The two of them combined give you all the info you could possibly want. At the touch of a button, you can see your location on a topo map or elevation chart. There is a plethora of information as he has marked shelters, unofficial campsites, towns, water sources, viewpoints, road crossings, photos, and pretty much anything you can think of. This would not be in place of maps or a guide as it doesn’t have all the same sites and sources in the guide, but it is a great supplement and sometimes has more info not listed in the guide. I know it seems pricey, but just buy one section and you’ll be hooked! I loved seeing exactly where I was on a climb and the locations of the unofficial campsites which aren’t mentioned anywhere else. No service is required as it works off your phone’s GPS. He also has the app available for many other trails including the PCT and CDT. If you still aren’t sure, here is the link to video demos of the app in action. Training in the rain gear. Perhaps one of the biggest worries for people headed out on the AT is what to do about all that rain. I didn’t feel like it rained too much on my hike and after I counted it out, it was more than I thought and there were 24 days with significant rain or a downpour. Everyone has their own strategy, but know that it may morph as you hike. It is cold rain to start the first month or so. Then it changes to rain in heat and humidity so high that it’s a relief. Depending on how late you end, the cold rain could return at the end of your hike. It’s a matter of personal preference and comfort levels, so test out strategies at home when you can. I am the type that gets cold chills and has difficulty warming once I’m wet, so I chose to be as protected as possible. I LOVED the umbrella and was the envy of many on trail in the rain. It was amazing and I found a link that showed me how to connect it to my pack so I could use my umbrella hands free. Remember that I am small, so I was easily covered fully and able to duck under branches, but I know bigger and taller hikers that also loved their umbrella. I would tell everyone to take an umbrella on trail and at least try it out. You can always send it home. I used the GoLite Chrome Dome which is now out of business. Some other retailers are selling it in the US and here is the Gossamer Gear link to getting that umbrella. Some rains were blustery and horizontal and the umbrella still helped and kept my core dry. Other times I’d be in a full downpour and almost all of me would stay dry. Just love it! I also carried a light rain jacket, OR Helium, rain pants. and blue latex gloves to go over my gloves. The rain pants may have been overkill, but for me they were worth carrying for the few times I used them, mainly early in the hike. Some did use ponchos, just a rain jacket, or nothing at all. Just know you will get wet with all these options so it’s how comfortable you are with being wet and how much protection do you want. In addition, I used a trash compactor bag as an inner liner in my pack and it kept everything completely dry. Yes, the pack was wet, but it dried quickly and will usually get wet anyway with a pack cover. What Tent Should I Bring? The thing about the AT is that it is not a remote trail with no shelter. It will have inclement weather, but your shelter can vary greatly person to person depending on your comfort level and pocketbook. It does get quite humid and hot at times, so an option of mesh and draft is nice. I used a cuben fiber tent from ZPacks called the Soloplex and I highly recommend it, but it is really expensive and understandably not necessary. There are shelters that many use, but don’t count on them and be prepared to use a tent in the rain if a shelter is full. My advice is to go as light as you can and still afford it. There are a whole range of tents so don’t fret. If you get a tent that is not free standing, I suggest cuben fiber over sil-nylon if you can afford it just because the sil-nylon sags and will be a pain to have to tighten it repeatedly through the night in rain. If you choose sil-nylon, the Tarptent, Light Heart Gear, and Six Moon Designs tents are great options. It won’t be the end of the world, but just a pain from time to time. As for the free standing tents, with poles…if you don’t mind the weight of carrying it, go right ahead. Just remember that it also absorbs a ton of water, will be even heavier after rain, and takes a ton of time to dry out too. A good option here would be the Big Agnes Fly Creek. These aren’t all the options, just the more popular ones. Basically, you get what you pay for. It is quite humid and wet out there sometimes, but if you keep your things dry, down is not a problem at all. It is much lighter, so I prefer it. I get cold easily and used my 10 degree down bag (which is probably 20 degree after the CDT) and down jacket the whole way and was fine…but I definitely could have gotten away with ~30 degree bag and it was used more as a blanket or not at all much of the trail. The down jacket was a pillow most of the trip, but the few times I used it, I was happy to have carried it. Again, I get cold easily. My point here is, if you want to use down, it will be fine. lasts for 70 launderings. Here is the link to the form if you’re interested in having your clothing treated. They were wonderful to work with! The section where I experienced the full height of the ticks was the second half of Virginia, but it can occur anywhere anytime. A great thing about the AT that makes it appealing to many hikers is that there is very little planning required. As far as I can remember, there aren’t any places where I’d say you MUST send a resupply box. Now there may be a couple where you will walk out with 20 of the same overpriced bar and a jar of peanut butter, but you won’t starve. One complaint I have about the AT Guide is that you do have to thumb through it to find towns and there isn’t a list of them in an index with the mileages. I do, however, have a planner from fellow hiker, Peanut Eater, who made this spreadsheet I used and enjoyed on the AT and the CDT. You will need to specify it to your planned pace and your year’s mileages/towns, but it’s great! It is also a reality check to see the dates and mileages required to hike it in 5-6 months. Peanut Eater’s AT Planner…click here to download. I’ve made a master copy that can be shared. Just click on this link and it will bring it up in Google Drive. You don’t need a login. You can then save your own copy and rename it so that you can make your own doc and edit it as you please adding/removing towns. I think most towns are listed on the master, but I’m sure some might be missing. If you prefer excel, just download it under the “file” tab when it comes up. I found it to be helpful to keep it in my Google Drive as it automatically synced with my resupply person, anyone I shared it with, and the embedded chart I had on my blog. For planners, it’s a piece of GOLD. THANK YOU to Peanut Eater for sharing it! There is one thing the AT definitely isn’t lacking and that’s Trail Towns. I stressed about this going into the hike and tried to plan out each town stop. It can be frustrating as the AWOL Guide doesn’t have a list of the towns and you kinda have to wade through the pages to find them. In 2016, a hiker named Clarity did the great service of listing each town and where it is in AWOL’s book with some basic details. Wish I had that when I hiked! Thank you to Clarity! With the abundance of towns and unpredictable events like weather and injuries, it is very difficult to make a plan ahead of time, so be willing to be flexible and leave room for changes. A friend of mine made me a listing of their trail town experiences and thoughts and I’ve done the same for those interested in my thoughts. Bear in mind, I tend to hike larger mileage gaps between towns than most and when I get to town I tend to avoid the hostels or places where a lot of hikers would be. I look for a quiet place that is fairly affordable, has a continental breakfast, laundry and most importantly, has good wifi! It’s all a matter of personal preference, but here is my two cents of the AT towns I visited. I found it helpful to carry a copy of this on my phone and used my friend’s suggestions as I hiked as it’s all Greek months ahead of time when you aren’t even there yet. Click here to see my AT Trail Town Thoughts. Oh man, people stress way too much about this one! You have two options. One is to start at the Springer Mtn parking where you will hike uphill and south on the AT for a mile to summit Springer and then back down again to hike north to Katahdin. The other option is to start at Amicalola Falls State Park and hike 9mi on the approach trail. I hiked the Approach Trail and my journal entry about it is here. I chose to do it for a couple reasons. One is that I didn’t want to hike south to get to Springer. I liked the anticipation and feeling of walking up the Approach. Second, I will only be there once, so why not see the falls and hike those infamous 604 steps up to the top? My two cents, the hike up the steps to the top of the falls was about a mile and totally enjoyable. The rest of it going to Springer was somewhat boring. I’m glad I did it and still wouldn’t feel right about hiking south on a trail to begin it and turn around. For that same reason, I chose to hike north off Katahdin at the end doing the Knife Edge Trail rather than back down the AT the way I came up. When will I be able to do it again and why not see something new? If an extra 9mi has you in a tizzy you might want to think again about hiking 2,185mi. If you choose to start at Springer, at least drop by Amicalola Falls State Park to officially sign the register, see what number northbounder you are, and weigh your pack. Screw hooks for wooden tent platforms. Starting around mile 1790 and going on through Maine, the trail is MUCH SLOWER going and your mileage will drop significantly by about 1/4-1/3. I was doing mid to upper 20s before I hit the Whites and it dropped to upper teens and low 20s the last few weeks of the trail. It’s due to a combination of things…It’s the end of the trail and your body is tired. There are tons more rocks, roots, and steep ups and downs which make for very slow going. Finally, there is much more scenery and lakes and you’ll want to just stop more often to take it in and enjoy it. Maine is even slower, so don’t think you’re in the clear after New Hampshire. From about mile 1790-1866, you are in the Whites and required to sleep at designated campsites or really nice huts where you can pay a lot or work for stay. I won’t go into detail as it is explained in the AT Guide, but I found it easy to camp and avoid the huts as I don’t like mass group bunking. I was still able to stop in the huts along the way and was offered free food as a thru at each hut, so that is possible, but it will depend on how many hikers are also around you. If you choose to tent, there will be many times when wooden tent pads are required to pitch on. This is difficult to do with a non free standing tent that needs to be staked out, so I recommend getting little screw in hooks like the one I have pictured here. There is also a stealth camping list for the Whites that I have linked here that many find helpful too. Enjoy it! It’s the best part of the whole trail and you’ve worked hard to get there! Katahdin casts an early morning shadow. I just loved my Katahdin experience! Camping at the Birches allowed for a relaxed ascent as it is the final option to camp and just 5mi before the top of Katahdin. Bear in mind that it is still a full day of hiking as it is a slow 5mi and you’ll need time to celebrate and then return down one way or another. I really recommend starting out before the sun rises as it completely added to the experience and hiking up as the sun rose and the mountain cast a shadow over us was pretty incredible. I chose to take the Knife Edge Trail off Katahdin for multiple reasons. Mainly, I knew it would be a unique experience and I wanted to experience something new rather than returning southbound on the AT, which I would find to be anti-climactic. You’ll hear a lot of hype about how dangerous it is and how scary “the Chimney” is, but if you’ve hiked the AT, it isn’t anything you haven’t already done. Many choose to hike up Katahdin with a day pack and worry about having to take their whole pack up over Knife Edge Trail…again, it’s nothing you haven’t already experienced and it is a narrow rocky ridge, but not anything you wouldn’t be able to do with a pack on if you have already done the rest of the AT. *It’s called the green tunnel for a good reason. Much of the hike will be in the woods with few views once the trees leaf out. The mental drain will really happen as the heat and humidity sets in north of West Virginia. Be ready for it and have strategies for entertaining your mind and passing the time. I used music, audiobooks, hiking with fun people, and phone calls to make it more enjoyable. *It will be tempting to stop in towns and socialize early on, but keep a good pace as it only gets pricier and more rugged up north. New Hampshire and Maine are the reward, but they won’t feel that way if you are too tired, too late in the season, and/or too broke to enjoy it. Just remember that down south. *Don’t limit yourself to camping at shelters. You have a whole forest out there and there are tons of unofficial campsites. Change it up and make it an adventure. *They call Pennsylvania “Rocksylvania” and that is deceiving as it’s actually north of PA where it gets really rocky. The rocks don’t start until well into the state (north of Port Clinton, PA, mile 1214) and when they do come it’s in spurts, so your mileage won’t go down too much. *Your knees will HURT! I’ve never felt hiking in my knees and if you have knee issues, you may want to rethink this one. It is the downhill more than the uphill that takes many off the trail. Especially the last 400mi of trail…you’re gonna feel it! *Dampness+Rain+Humidity= Lots of chafing! From day one til the end I’d have flare ups of chafing like I’ve never experienced before. Just be sure to always carry something. I used body glide, but many others needed stronger things. Just carry something small all the time as it can come out of nowhere and it is quite painful. *Verizon is, by far, the best reception on trail. I had reception each day (often most of the day), except for maybe a few days. I wanted to thank you, yet again. I completed my thru-hike of the AT on October 8, and came home in one piece, physically, mentally and spiritually. You and I had exchanged emails a few times during my prep phase, and I liberally took advantage of the advice you posted from your Triple Crown hikes. I had an absolute blast, loving almost every minute of the AT. Thanks for your help and perspectives!